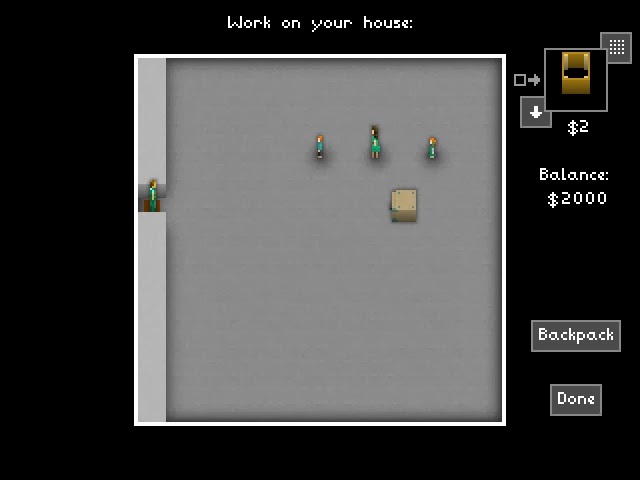 I have spent three days with Castle Doctrine. Here are some thoughts. 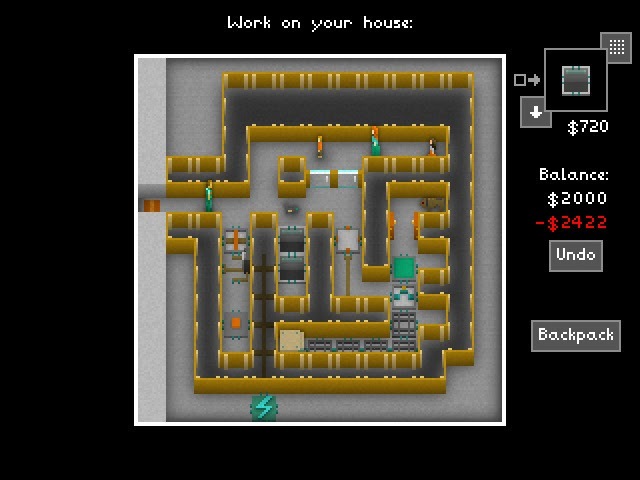 I've had Castle Doctrine on my radar for a while now but I've made this New Year's resolution so I was going to do my best to hold off on it. After reading Jason Rohrer's article about Steam sales and gaming pricing (which I mostly agreed with but could also relate to in my own gaming and purchasing habits) I decided I have to support this prerelease. It was the article that convinced me in the end - just like with Ridiculous Fishing when I read this article about IAPs and the pricing model of their game. On the 2nd day I had time to actually attempt to build a house. I built a very basic house with a few distractions but no real traps and gave my wife a shotgun, which she promptly used to shoot me in the face. Ok, lesson learned: not even my wife recognizes me. I rebuilt my simple house two times and finally got to my own vault - then sat back and watched the tapes as others attempted to break in my home. There is a kind of voyeuristic pleasure that I get out of watching other players snoop around my premises and a schadenfreude when that trap is sprung and I've killed another robber, trying to steal my hard earned cash and hurt my family. My wife with the shotgun didn't trick anyone. They all hid while she escaped but one poor fella, not paying attention, fell into one of the pits as I had hoped. My first kill! But wait, that guy I killed might have just been another father trying to steal to to better protect his family, and judging my his amateurish attempt his was just that. Strange. With a little more description or story of a kind this could be a very disturbing experience indeed. That day I did a little robbing of my own, with no money and nothing to lose I explored the houses with the lowest deaths/attempts ratio. I would poke around a bit until I found a pit bull and then I'd ran away, just to try straight away again. I was finally killed by an ingenious trap involving a Chihuahua. Then killed again soon after by a second only slightly less ingenious (but more surprising) trap using electric floors; and with no where to go, surrounded by glowing red grid floors, I had to choose to throw myself onto them - bizarre and disturbing. And hilarious. But now I had seen two traps I could restart and build them myself! Very quickly this game was revealing it's depths. Day three I spent rebuilding the traps that I had been captured by on day 2 a and experimenting with different circuitry and reading what little information there is on the wiki. Preparing...learning. I now have got 4 of my friends to buy copies of the game and they are actively playing. One was on the fence but after showing him some gameplay and some of the tricks I had learned he was convinced. I hope that a little more polish comes with the Steam release tomorrow. An menu, title screen or small intro would be nice, a full screen option, maybe controller support and the ability to rotate some pieces would be great. I hope this thing really takes off and we can get a circuit planner app - that I can mess with on the go just to try out new ideas for my house but I doubt that is going to happen. Minecraft-like updates with new pieces would be cool and keep the game fresh. I'm looking forward to exploring the depths of Castle Doctrine, especially now that I've got 5 people in my circle of friends who have bought the alpha - maybe we can start our own server.